Led by UMD researchers Liangbing Hu, Robert Briber and Tian Li of the department of materials science, and Siddhartha Das of mechanical engineering, the team transformed a piece of wood into a flexible membrane that generates energy from the same type of electric current (ions) that the human body runs on. This energy is generated using charged channel walls and other unique properties of the wood's natural nanostructures. With this new wood-based technology, they can use a small temperature differential to efficiently generate ionic voltage, as demonstrated in a paper published March 25 in the journal Nature Materials. If you've ever been outside during a lightning storm, you've seen that generating charge between two very different temperatures is easy. But for small temperature differences, it is more difficult. However, the team says they have succesfully tackled this challenge. 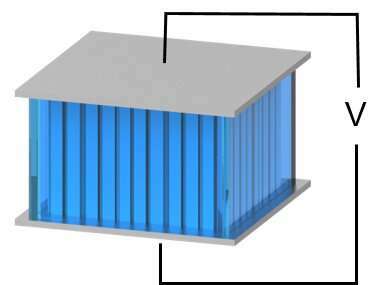 Hu said they now have "demonstrated their proof-of-concept device, to harvest low-grade heat using nanoionic behavior of processed wood nanostructures". The researchers used basswood, which is a fast-growing tree with low environmental impact. They treated the wood and removed two components—lignin, that makes the wood brown and adds strength, and hemicellulose, which winds around the layers of cells binding them together. This gives the remaining cellulose its signature flexibility. This process also converts the structure of the cellulose from type I to type II which is a key to enhancing ion conductivity. A membrane, made of a thin slice of wood, was bordered by platinum electrodes, with sodium-based electrolyte infiltrated into the cellulose. The regulate the ion flow inside the tiny channels and generate electrical signal. "The charged channel walls can establish an electrical field that appears on the nanofibers and thus help effectively regulate ion movement under a thermal gradient," said Tian Li, first author of the paper. .
"We are the first to show that, this type of membrane, with its expansive arrays of aligned cellulose, can be used as a high-performance ion selective membrane by nanofluidics and molecular streaming and greatly extends the applications of sustainable cellulose into nanoionics," said Li summing up their paper. We have awful lot of heat in Volcanoes and Hot Springs !